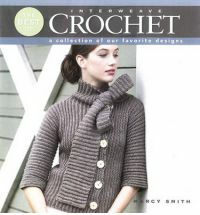 This book is a collection of some of the best designs, tips, and techniques from Interweave Crochet magazine’s first five years. You’ll find some of the most popular designs including a few of my favorites like Lily Chin’s Lace Dress and Donna Childs Sir Stephen the Bunny. In addition to the patterns, you’ll find articles on different techniques such as Tunisian Crochet, Symbolcraft, closure and seaming techniques, and much more. The patterns cover a wide variety of items, including dresses, tops, vests, toys, shawls, afghans, and bags. If you’ve tried to find some of these patterns and failed, or just want a collection of some of the best designs from the magazine, then this book is a must have. While you may not like or want to make some of the patterns in the book, it’s an excellent source for different techniques and ideas.